Since its formation in September 1991, under the enthusiastic leadership of Eric Atkins DFC, KW, the Mosquito Aircrew Association acquired from its membership a considerable quantity of archival material which required a permanent home with staff to research and catalogue, analyse and classify this material for the benefit of the families of the contributors as well as providing access to scholars and researchers on the outstanding part played by the Mosquito aircraft in the Second World War. As the then archivist, following the decision of the members of the Mosquito Aircrew Association to pass over this material to The Second World War Experience Centre, I should explain how these archives came about and generally what they contain. Much is owed to Mr Barry Blunt BA(Hons), a teacher from Marple, Stockport who, as the past editor of the Association’s magazine The Mossie, put the majority of the collection together. From a modest start in September 1991 the Association embraced over 800 active members from over 25 countries, all anxious to ensure that the Mosquito legend is preserved for future generations. Taking over the editorship of The Mossie in October 1998, together with the associated archives, I found it to be a most humbling experience as many of the men who flew and serviced this most versatile aircraft have an overwhelming desire to record their experiences in their ‘retirement’ years. In particular, they wish to remember and honour the achievements of those who did not return. 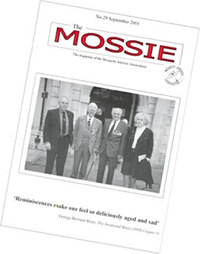 Publishing three times a year the Association’s magazine, The Mossie has been the catalyst which has brought into the Association the material which, during the year 2001 was progressively passed into the safe keeping of The Second World War Experience Centre. These archives are uniquely able to contribute to the Centre’s prime objective of “preserving and studying the evidence of the individual in the circumstances of war, 1939-45“. We have a large quantity of letters, articles and flying log book summaries from members. Included with these articles are many historic photographs, taken by members with both personal and official cameras. Copies of squadron Operation Record Books, together with profiles and research on many of those who flew and serviced the Mosquito in all theatres of the war, also feature strongly. Additionally, there are a few three dimensional archives, such as an airspeed indicator (ASI), which are in stark contrast to today’s computerised instrumentation. The Mosquito was perhaps the first real multipurpose aircraft created by any air force. Over 8,000 Mosquitos were built, flown and serviced by over 100 squadrons. Its unique place in history was preserved by a very strong Committee under the chairmanship of Eric Atkins with a most distinguished President, Air Marshal Sir Ivor Broom KCB, OSO, OFC**, AFC and Vice President, Air Vice Marshal L W G Gill DSO. We are confident that the wide range of recorded experiences of those who flew and operated the Mosquito will in future be in the professional care of an organisation dedicated to keeping the ‘Mosquito Legend’ alive. The Centre is proud to Host the Mosquito Aircrew Association Archive. There have been many researchers accessing the MAA since it came to our care and we will soon list here some of the lives and material recorded in it.